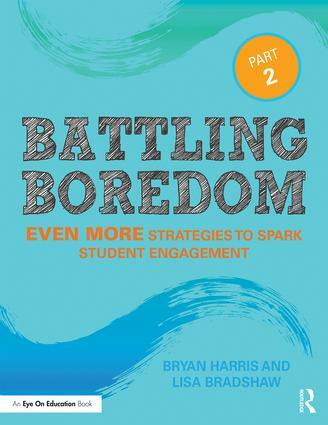 "Battling Boredom Part 2 is a must-have for all educators. As an easy read, it sets the context for the importance of student engagement through brain-based and educational research. Filled with pragmatic and useful classroom strategies for all levels, the book purposefully integrates technology into the classroom learning, promoting deeper engagement. Relevant and user friendly, Battling Boredom 2 is the desktop resource for today’s teacher." "This book is PACKED with strategies to engage students. The strategies are specific, they include variations, and they are classroom-ready for action. Another winner!" Eric Jensen, PhD, author of 30 books, including Teaching with the Brain in Mind.